The news broke after the directors had held a secret meeting over the weekend, a meeting that manager Mr Harry Potts did not attend as he was with his players for a friendly at Peterborough in which McIlroy didn't feature. It was left to Potts, who McIlroy had replaced in the team in 1950, to break the news to the stunned player but publicly the board gave no explanation with Lord claiming it was a club matter and no concern to anyone else. Lord ruled over Burnley Football Club and no one was ever permitted to question his decisions. This was the man who, for a cup replay against Bradford City, removed kids' prices at the eleventh hour and answered complaints by saying the kids should have been in bed and not out at night. 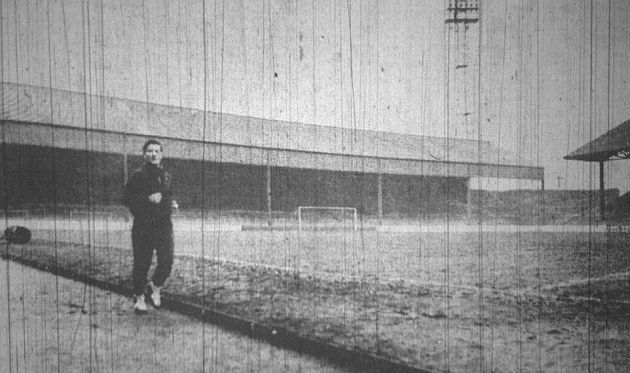 He got away with most things, but within hours he found he'd got more than he bargained for this time, although cleverly he'd managed to divert the attention on to manager Potts and it was 'SACK POTTS' that was daubed on his factory gates at Lowerhouse. Less than one day after the decision had been announced the Burnley Express had been inundated with letters for their newspaper, with only one supporting the chairman. 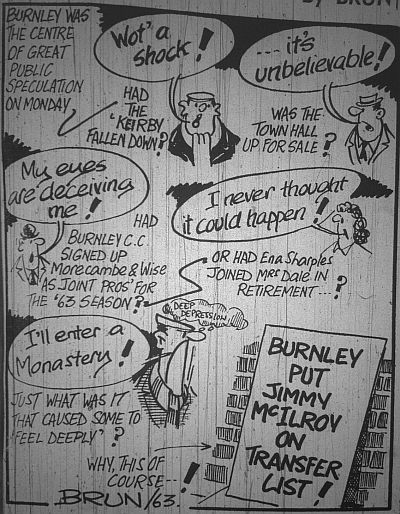 One reader wrote: "I am shocked, stunned and bewildered at the decision of the Burnley FC board of directors to place Jimmy McIlroy on the transfer list. How can a team which has become respected throughout Europe for its standard of football part with its greatest inside forward since the war?" The decision to give no explanation for the decision had really angered people. This was the player who was idolised and less than a year earlier, on the return from the FA Cup Final at Wembley, the shouts heard above all others outside the Town Hall were: "We want Mac." Petitions were immediately set up, some demanding that the decision be reversed and others asking people not to go to Turf Moor again if McIlroy was allowed to leave. The most hard hitting of the petitions was organised by Mr Norman Hadfield. He told the Burnley Express: "I think the directors' decision is to be deplored." His petition proved popular, with people eager to sign. It read: "We the undersigned object, for the reasons stated below, to the manner in which Jimmy McIlroy has been placed on the open-to-transfer list. "McIlroy, since joining Burnley at the age of 18, has been the model footballer, both on and off the field, and one in whom the people of Burnley have felt justifiably proud. "HIs loyalty to Burnley has been second to none as was shown when those lira-laden Italians were scouring Britain for world class players, with McIlroy at the top of their list. However, he turned his back on the fabulous wealth he could have attained and stayed with the comparatively unglamorous Burnley. "About this time, Mr Lord in a statement to the Press, said that he would do all in his power to ensure that McIlroy stayed at Burnley for the rest of his footballing career. This statement seems to have gone by the board. "Mr Lord states that this is a club matter, but surely we, the loyal supporters, also deserve an explanation, and it will be your earnest endeavour to boycott all first team games until this is forthcoming." Meanwhile, McIlroy, who was stunned at the news, was excluded from any team involvement and was forced to train on his own at Turf Moor. Never before or since has news of the transfer listing of a player brought such a reaction. Dads were arriving at schools to tell their sons, some with tears in their eyes, at the prospect of Burnley losing its favourite son.